Why did Trump bring the entire Senate to the White House to tell them nothing new about North Korea? Why did Trump summon the entire Senate to the White House to tell them things they already know about North Korea? 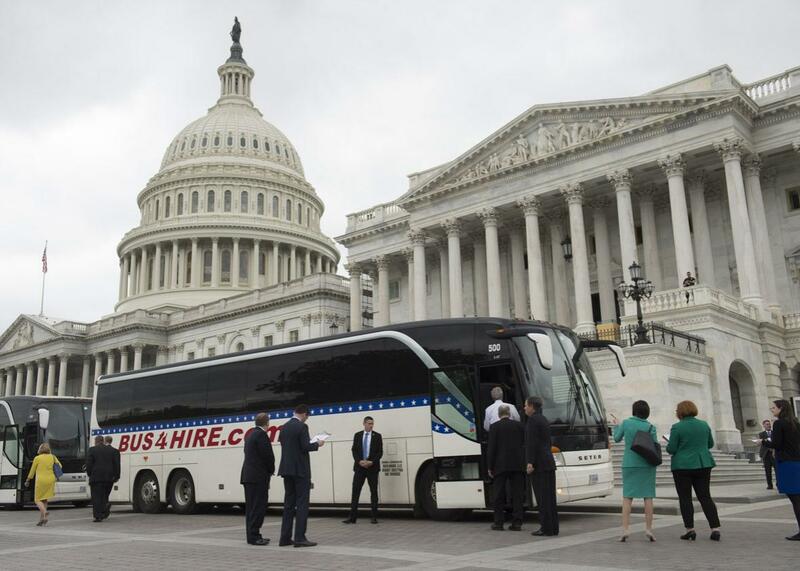 U.S. senators board buses at the Capitol in Washington, D.C on Wednesday. If you had started to think that President Trump and his team might know something about diplomacy after all, that their firm talk and shows of strength might finally prod the Chinese and North Koreans to get rid of Kim Jung-un’s nuclear weapons, well, think again. Trump’s holsters are empty, and so is his brain trust. They’ve got nothing, up and down. In recent days, Trump has sent an aircraft carrier battle group and a guided-missile submarine toward North Korea’s shores. Vice President Mike Pence has gone to the Demilitarized Zone and squinted through the binoculars at the North Korean guards, so they can see his resolve. Pence also declared, “The era of ‘strategic patience’ ”—President Obama’s policy of containment, as opposed to action, toward North Korea—“is over.” To lay the message on thick, Trump summoned all 100 U.S. senators to the Executive Office Building, next door to the White House, on Wednesday, for an urgent briefing on the subject from the secretaries of defense and state, the director of national intelligence, and the chairman of the Joint Chiefs of State. Buses were even chartered to take the lawmakers on their unusual field trip. And what did these top advisers and cabinet secretaries say? Apparently, nothing. Other senators, from both parties, told reporters the same thing: They learned nothing new, they wondered what the big deal was, why they were dragged down Pennsylvania Avenue for such a waste of time. In short, after what the secretaries called “a thorough review of U.S. policy” on the subject, the president decided—though they didn’t put it in these terms—to pursue the exact same policy that the past four presidents have pursued. So what was that all about? The president and his team spent all week talking nasty and pumping iron, gearing up for the big match. Then … there was no match. In one sense, we should all be relieved. Trump has decided not to go to war over the next test of a North Korean missile or nuclear weapon. He has concluded, so it seems, that this problem—like many others that he’s taken a look at, now that he’s in charge of solving them—is a lot more complicated than he’d imagined. This may be, in the end, a pragmatic acknowledgment of the realities at hand, but it is no way to run a foreign policy. You don’t issue warnings and ultimatums, luring friends and foes to believe that you might really use military force, possibly as a way of compelling them to solve the problem themselves—and then back off and say you’ll deal with it the way it’s always been dealt with, somehow, at some point. In the high-decibel run-up to this anti-climax, Trump has once again shown these same friends and foes that they shouldn’t pay attention to anything he says—that he doesn’t necessarily mean it, that he and his threats and his promises are not to be taken seriously. The members of Congress have no doubt learned the same lesson. Every senator was dragged away from Capitol Hill to hear this briefing—a matter of supreme national security, it seemed—and it turned out to be nothing they hadn’t been reading in the newspapers. The next time something like this happens, some are no doubt muttering, they should stick to their work. The next time he makes a promise, they should ignore it.